The Food Guide provides information about the amount and kinds of foods that people need to eat most days to get the nutrients needed for good health. Using the information in the Food Guide also helps people not to get too much of some nutrients, such as energy, saturated fat and salt (sodium). Most choices of foods should be ones that are the most nutritious choices from the food group. Most of these choices will be low in saturated fats, low in added sugar and added sodium; and will provide essential nutrients. 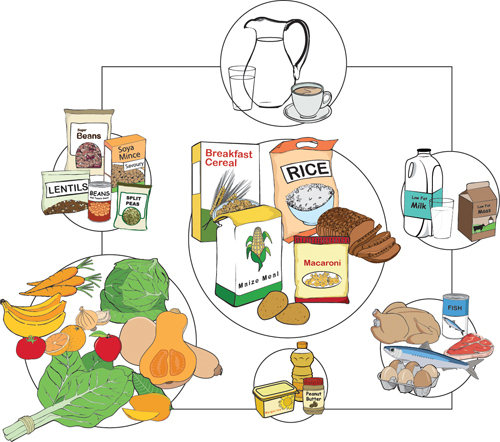 The food guide includes information on the number of units of food from each group needed each day; and it includes information on the size of each food group unit. A typical portion of some foods will be made of 1 unit of that food (e.g. one unit of fruit is one apple), while other people typically eat many units at one time (e.g. a teenage boy may have 4 units of starchy food for breakfast, his portion of soft porridge will be 2 cups). The food guide includes information on the number of units of food from each food group given at three different typical energy levels.